Jason Brooks of Tallmadge, Ohio caught the fish of a lifetime on June 25 when he hooked into a monster steelhead. They were 17 miles offshore and when they landed it. They knew it could be a potential state record and quickly raced back to the marina. 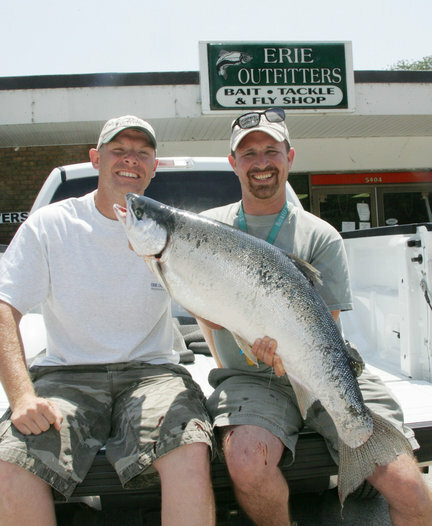 The closest tackle shop was Erie Outfitters and the shop had a certified scale. The fish was placed on it and registered at 21.3lbs besting the old record of 20.97lbs caught off the Conneaut harbor back in 1996. An hour later, Fisheries Supervisor Phil Hillman of the Division of Wildlife checked the fish and declared it a steelhead, not a salmon. The fish measured 38" and some wonder if this hog ever made upstream this past season.